The Soyuz rocket carrying U.S. astronaut Nick Hague and Russian cosmonaut Aleksey Ovchinin. All crewed launches have been suspended by Russia’s space agency following yesterday’s Soyuz rocket failure. That’s a problem, because much of the world relies on Russian rockets to get both cargo and people into space. Consequently, we’re now facing the very real possibility of having an uncrewed International Space Station—something that hasn’t happened in nearly two decades. 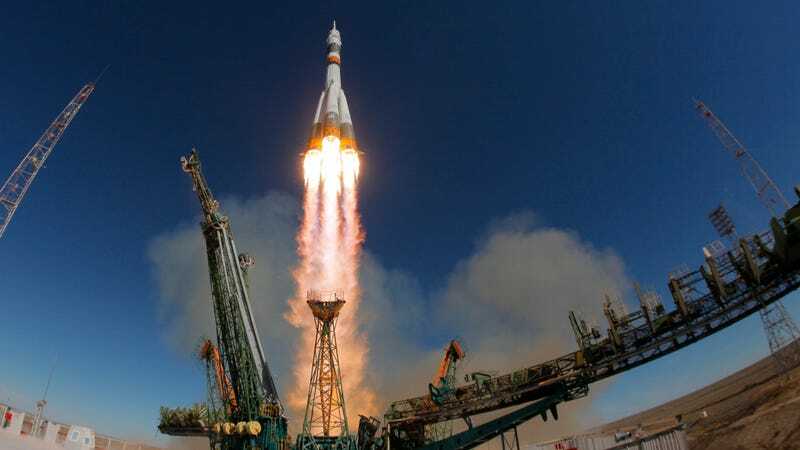 Early yesterday, a Soyuz-FG booster rocket with a crewed Soyuz MS-10 spacecraft on top experienced a serious malfunction about three minutes into the flight, forcing U.S. astronaut Nick Hague and Russian cosmonaut Alexey Ovchinin to make an emergency landing in the Kazakh steppe. Both are reported to be in “good condition,” but the same cannot be said for the rocket, which crashed around 25 miles (40 kilometers) from the city of Zhezkazgan in the Karaganda Region of Kazakhstan. It’s the first incident of its kind for Roscosmos—Russia’s space agency—since the fall of the Soviet Union. In response, Russian officials have suspended all crewed launches pending a review of the booster rocket failure. A criminal probe is also underway to determine if safety regulations were violated during construction. To that end, a Russian government Investigative Committee is inspecting the launch site and seizing documents, AFP reports. The Soyuz rocket carrying US astronaut Nick Hague and Russian cosmonaut Aleksey Ovchinin. With Soyuz grounded, there’s no feasible (or safe) way to send astronauts to the ISS, or even space for that matter. Ever since the United States retired its Space Shuttle program in 2011, it has being relying on the Russians. Private-sector solutions are currently in the works, including Boeing’s CST-100 Starliner and SpaceX’s Crew Dragon, but neither program will be ready to send humans into space until at least the summer of 2019. China’s space agency has the capacity to send astronauts into orbit, but its next scheduled crewed launch isn’t until 2020. Not that it matters to the U.S.: NASA is currently prohibited by Congress from working with the Chinese space agency due to security fears. The inability to send people into space means we could have an empty ISS in a couple of months, which hasn’t happened since the station’s first crew arrived in November of 2000. There are currently three crew members aboard the ISS: NASA astronaut Serena M. Auñón-Chancellor, the European Space Agency’s Alexander Gerst, and cosmonaut Sergey Prokopyev. The trio is currently scheduled to return home in December, and they’re well supplied with food and water, said Kenny Todd, NASA’s ISS operations integration manager, at a press briefing held yesterday. Their mission could be extended, however, as the Soyuz spacecraft can last in orbit for 200 days, expiring in early January. So if the mission is extended, it’ll only be by a few weeks. An empty space station would be regrettable. There would be no one onboard to monitor and conduct the many scientific experiments currently underway on the $100 billion outpost. The good news is that the ISS can be kept operational by ground controllers, as Todd explained during the briefing. A shot of yesterday’s failed launch, showing smoke rising from the first stage booster. The timing could not be worse for Roscosmos, which is still reeling from an incident that happened back in August. A small air pressure leak was discovered in the Soyuz section of the International Space Station, the likely result of a manufacturing flaw. But the Russian space agency also considered the possibility of sabotage. Roscosmos is claiming that the Investigative Committee’s inquiry into this week’s rocket failure will be completed by October 20, which seems a bit rushed. That said, there’s no way of knowing how long Soyuz will be grounded, and when humans can once again be launched into space. Meanwhile, Roscosmos chief Dmitry Rogozin is claiming that Ovchinin and Hague will be delivered to the ISS in short order. These “guys will fly,” he said in a tweet, in which he posted a photo of himself with the astronauts. “We are planning their flight for the spring of next year.” It’s a completely unfounded claim, as no one can predict the results of the government investigation or how long the Soyuz crewed flights will be grounded. Rogozin is likely trying to save face amid the current embarrassment. To say that this situation is upsetting is an understatement. It’s a predicament that would’ve seemed inconceivable to both Americans and Russians at the height of the space race in the 1960s and 1970s. From the optimistic vantage point of the past, we were supposed to have space stations on the Moon and Mars by now. Instead, here in the year 2018, we can’t even put men and women into low Earth orbit. What the hell?